Kate and I started out from Denver in April of 2012 and drove to the Colorado National Monument. Ultimately we covered much of the American Southwest. Colorado National Monument wasn’t one of our planned destinations, but we decided to take a turn through the park since we still had some light on our first evening, before bedding down for the night at the El Palomino Motel in Grand Junction, which, while not fancy, was a perfectly fine stop for the night and very reasonably priced (I’m not being paid to say this!). The light was fading rapidly by the time we made it into the park far enough to see anything, but the clouds were beautiful and the deep shadows made the formations seem all the larger. It had rained a little earlier in the afternoon, and the sparkling puddles and darkened sand were soft and full of rich, early smells. 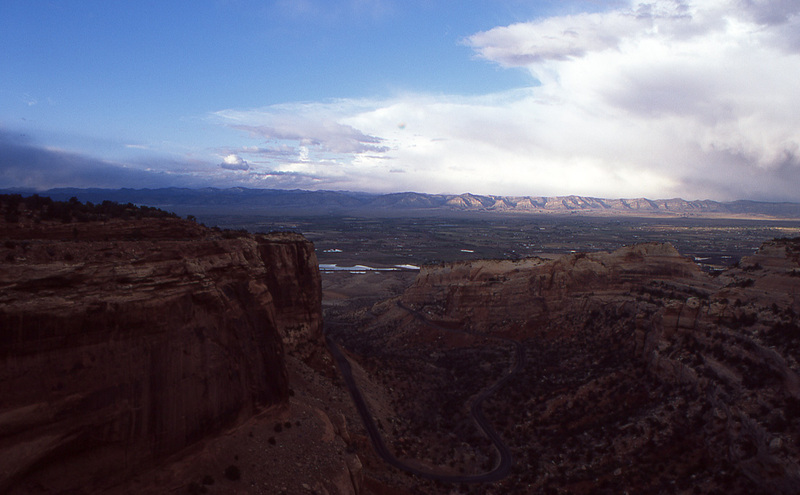 I had been to Colorado National Monument before, but I was young and didn’t remember it all that well. As with nearly everything I’ve seen in the American Southwest, it’s beautiful and geologically fascinating. After a classic American greasy spoon diner breakfast, we headed west from Grand Junction and into Utah. 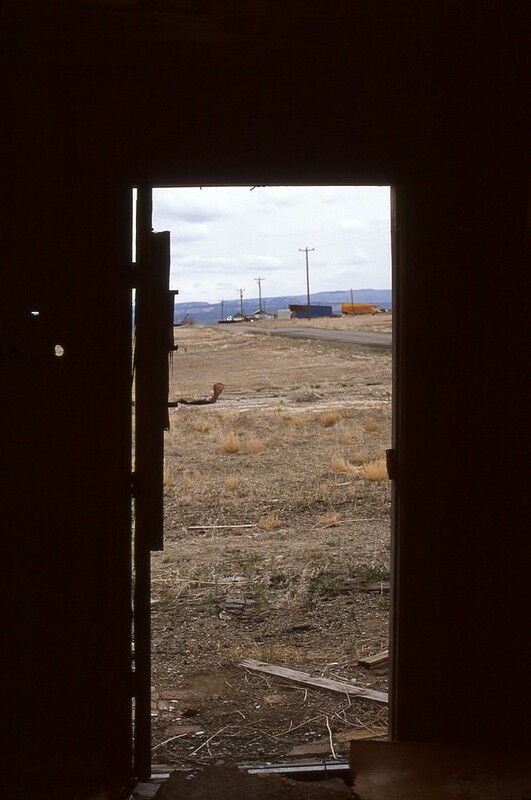 You can see the Rabbit Valley Interchange, an award winning steel highway bridge we passed near the state line, with my other medium format photos from the trip. Just over the border we looked through the abandoned railroad town of Cisco, Utah. A couple dozen collapsed and collapsing houses remain, and dozens of foundations and pits that probably once were foundations. After exploring a little, while heading out of town, we saw one property that appeared to be occupied still after all. I don’t know how long this young ghost town will stay abandoned. 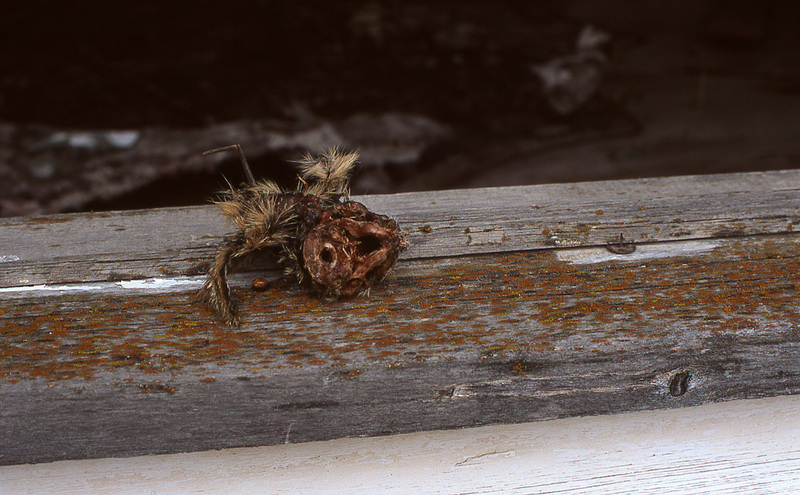 Evidence of resident wildlife is nothing new in a ghost town, but seeing a the freshly killed and picked-clean bones of a rat or ground squirrel on the sill of one abandoned window was a gruesome reminder of the brutal realities of life in the Southwest. Not a good place to be a member of the Order Rodentia. West at the junction of 191 and highway 95 and shortly we found the Butler Wash Ruins where a short hike reveals several ancient Puebloan ruins in a small canyon. 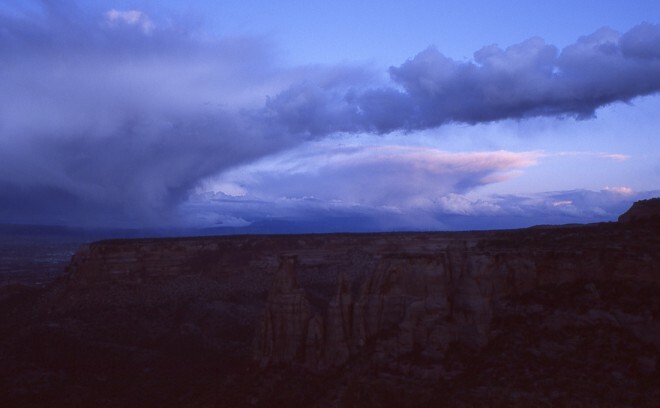 As we hiked the half-mile or so back from the observation point, the skies rapidly darkened and large pellets of snow began to fall. By the time we got back to the Jeep, the snow was sticking to everything and the wind was blowing a steady 10- or 15-mph. 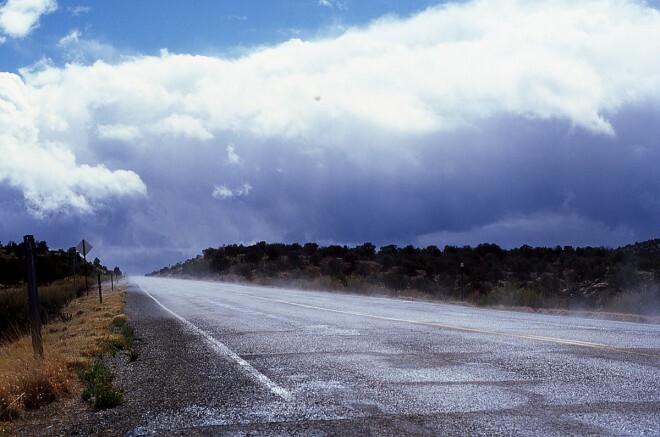 We headed west toward highway 261 in search of views and on the way to our anticipated stop for the night at Mexican Hat, on the border of the Navajo Nation. The snow came down so hard and fast it was nearly impossible to see the road and I was stuck at about 20 mph for half an hour or so. When about an inch had fallen, the snow stopped as suddenly as it had started and the sun came out, melting the snow on the roads almost as fast as it fell. It nearly skipped the liquid state and turned into billowing steam. 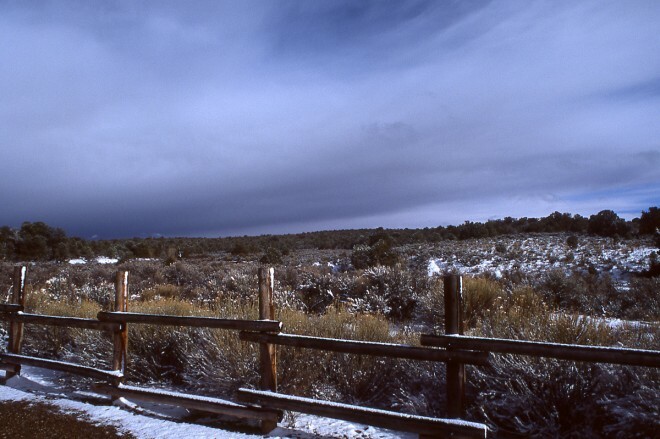 We stopped at the Kane Gulch Ranger Station a few miles south of highway 95 for a couple 4×5 shots, but that didn’t preclude a few 35mm shots, including one looking out on the freshly-fallen snow. 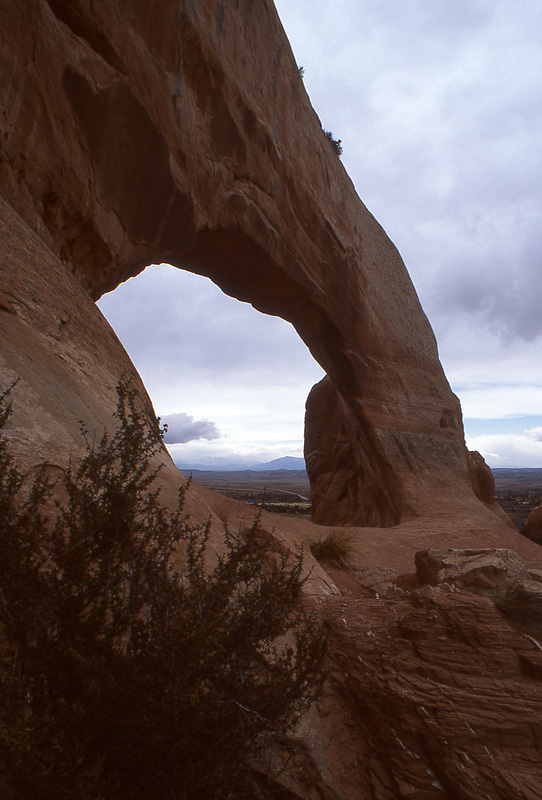 After a look at our watches, we realized we had plenty of time to take a turn through Natural Bridges National Monument before finishing the drive to Mexican Hat, and the Monument was only about 20 miles away. We turned around and stopped by the visitors’ center just moments after it closed, but with enough light left to make a few pictures. 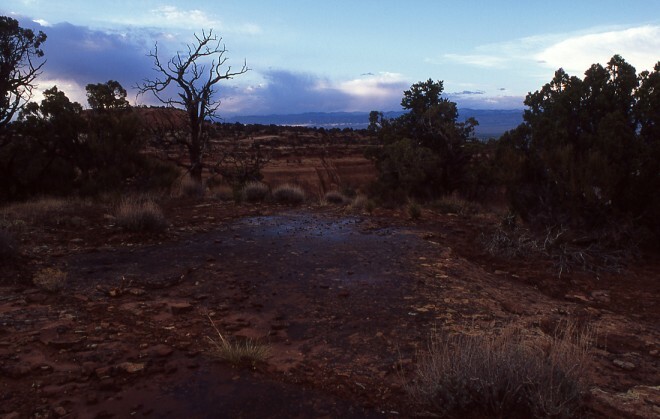 Here, too, the quickly-fallen and quickly-melted snow sparkled in puddles in the sandstone formations here near Kachina Bridge, the youngest of the massive natural bridges in the monument. Considered a very young bridge, it formed when a stream broke through the walls between White Canyon and Armstrong Canyon. 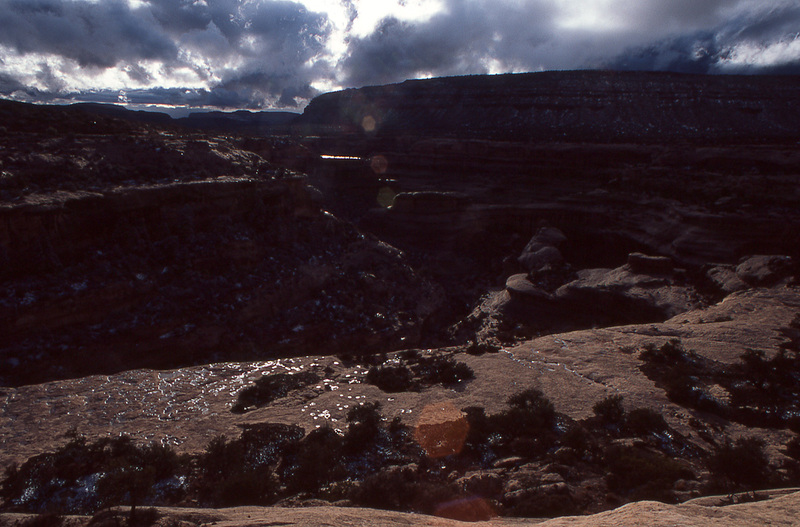 The Cedar Mesa Sandstone is the major geologic formation the bridges are composed of. Further south in the Monument, we made it to Owachomo Bridge in time to stick around for sunset. The last rays of light illuminated the large sandstone outcropping at the northeast end of the bridge, the “rock mound” it is named for. 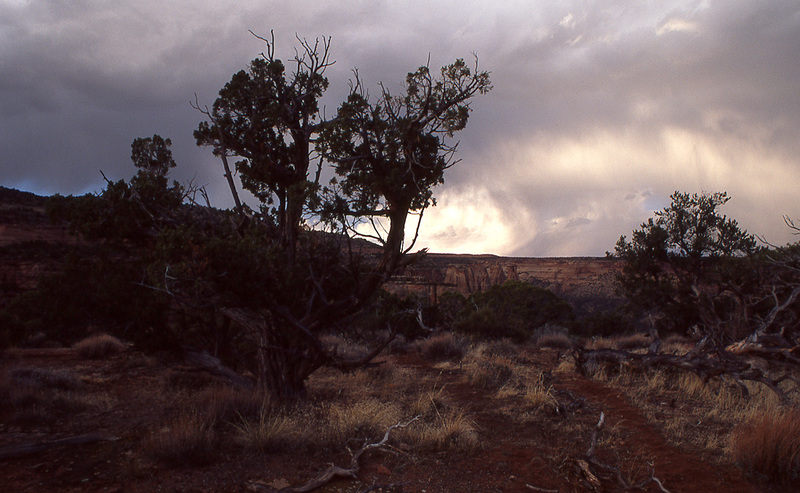 Throughout southeastern Utah, the desert is covered with sparse flora, including the occasional ancient piñon pines. They produce their delicious seeds, the pine nuts you’re used to paying $30 or more for a pound of, only when conditions are right for the cones to mature. 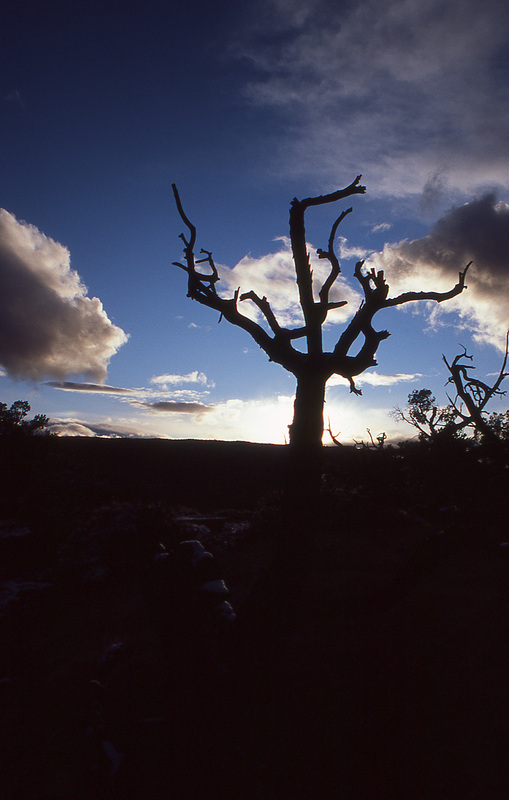 Did you know you can harvest pine nutes on BLM lands as long as you gather less than 25 lbs.? 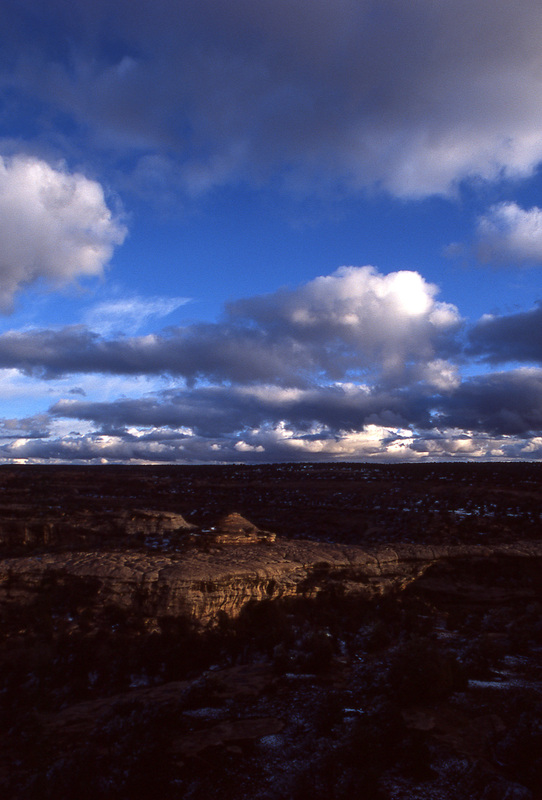 A large mesa outside the Monument serves as the backdrop to both Owachoma Bridge and Kachina Bridge, and we stayed near the former to see the sun set as the storm clouds that brought the earlier snow continued their retreat eastward. Fun fact: All three of the bridges in Natural Bridges Monument are among the ten largest natural bridges in the world. We filled up the Jeep and took a late-night side trip to Bluff, where we got the last room in town — a $150/night suite at the Desert Rose Inn and Cabins, which I talked them into giving us for $90 since it was nearly midnight. Bluff isn’t in the center of the beauty quite the way towns like Moab and Blanding are, but the room was great and the building was lovely. It was a well-spent night. 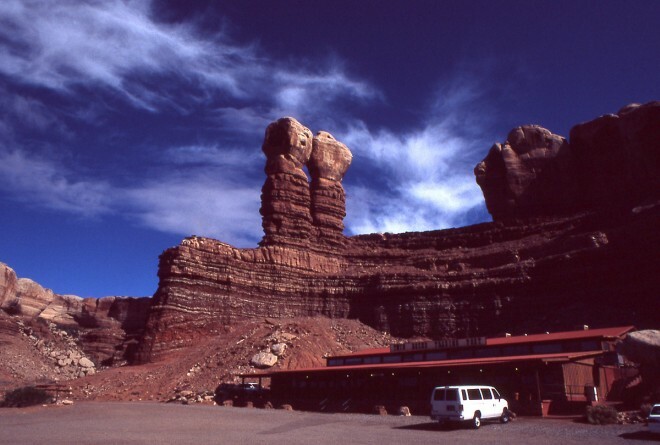 In the morning we had a breakfast of Navajo fry bread and honey with eggs and whatnot at the Twin Rocks Trading Post and Cafe, which I remembered vaguely from a childhood trip to the area and still heartily approve of. We also reloaded Kate’s camera bag; I’d packed five 24-exposure rolls of expired Fujicolor 200 film for her to shoot with Dad’s old Pentax ME-Super, and she went through them fast. 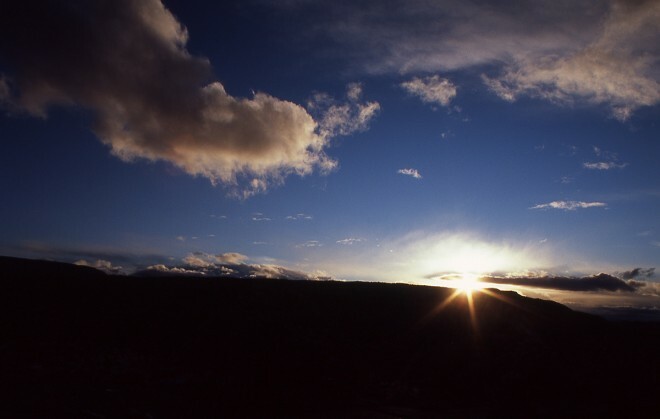 Not to mention that I was cruising through the Provia at about 2 rolls a day. They had a nice stash of expired Fuji Superia 200 at much-less-than-B&H prices, so I stocked us up. 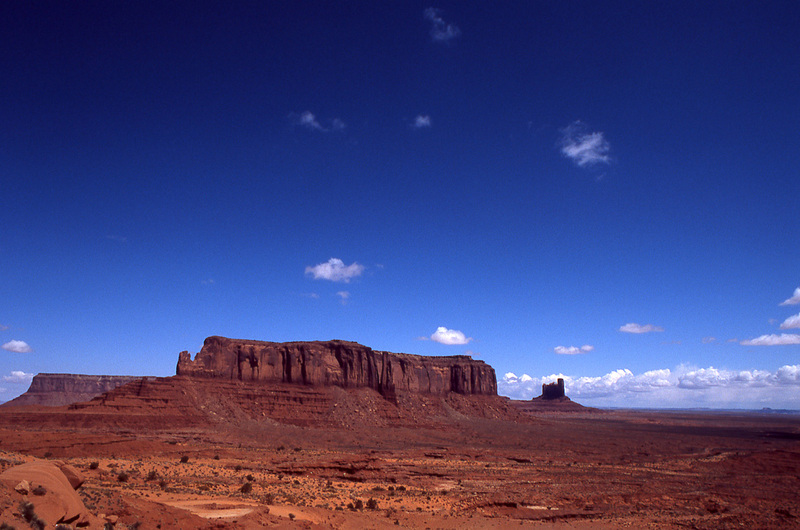 We headed out then to the Navajo Nation, where we stopped briefly at Monument Valley on our way to Canyon de Chelly. Interestingly, though Canyon de Chelly is a National Monument, it’s operated in conjunction with the Navajo Nation, who require that a trained Navajo guide accompany anyone who wishes to go in the canyon because the canyon is still occupied by the Navajo and full of an amazing number of ruins and spiritual sites. 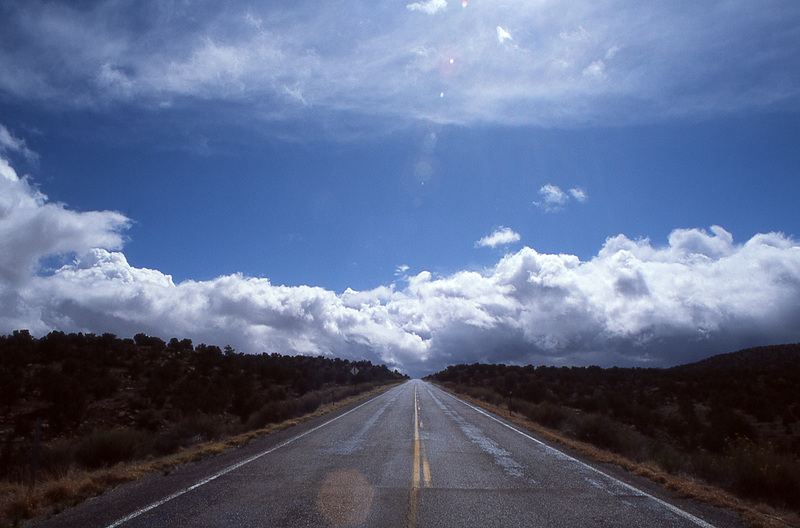 Driving around the rim requires no guide and is managed by the Parks Service. We hired a guide named Eleanor with Ancient Canyon Tours, who I’d heartily recommend. In the best ways, she reminded me of Marilyn Whirlwind from Northern Exposure. I’ll leave you with a frame that doesn’t include the mitten formations so well-known and visible from the visitors’ center. By the time we made it to Canyon de Chelly, I was out of Provia and shooting the expired Superia, which I may get around to posting … someday. All these frames were made with my Minolta XE-7, using either my Minolta FD 24mm f/2.8 lens or my Minolta MC 58mm f/1.4 lens, with Fujichrome Provia 100F, developed by Englewood Camera and then scanned at home. I used Photoshop’s Content Aware Healing Brush tool for some dust specks, and adjusted the exposure of some shots a little. As it got darker in the evenings, the shutter priority mode of the XE-7 seemed to compensate a bit too little. You can really see the flaring from the uncoated glass of the ancient 58mm on a couple of the shots above, but it’s a nice clean effect as far as lens flare goes.